"Do you have the magic touch? Your DS stylus has been infused with the power to paint! 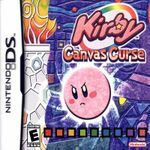 When Kirby gets turned into a ball by an evil witch, your hand-drawn rainbow paths become the only way he can find power-ups and reach the gates of each world. Draw loops to make him speed up, make ramps to jump danger, and draw walls to block laser beams and cannon blasts as you explore seven worlds packed with adventure! Stun enemies, break blocks, and much more - all with a touch of the stylus! Tap Kirby to dash into enemies and copy their abilities. Eleven abilities in all! Try timed challenges, take on bosses, or play simple but fun mini-games!"